This system consists of two Pentek 20 x 4.5 inch housings, a stainless steel bracket, isolating valve, opening tool and basic connections. The choice of cartridges (not included) can vary according to the situation. 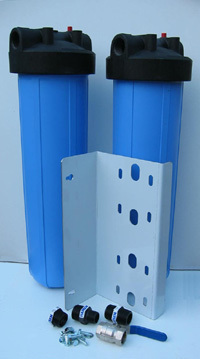 For a rural installation where water is supplied with a pressure pump typical cartridges can be 10 micron pleated sediment cartridge followed by a GAC cartridge or a NCP sediment / carbon cartridge followed by a calcite cartridge. For mains systems typical cartridges could be 1 micron spun type sediment cartridge followed by a 0.6 micron carbon block cartridge. For mains systems a suitable pressure limiting valve must be fitted. Your plumber should be able to supply this.